Has anyone ever told you to stop hiding behind a façade and let the real you out? The idea is that you’re like a Matryoshka doll, the kind that fits smaller and smaller dolls inside of itself. Eventually, if you dig deep enough, you’ll get to your core—your “real” you, the you sometimes hidden behind fear and the desire to fit in and the worry about living up to your parents’ expectations. People will insist that you’ve got to let that real you out, or you’ll be miserable. Well, kids, this is not what they had in mind. The Blurp Charlie Child Mask does indeed show someone “coming out” of someone else—but the mask takes things a little more literally. 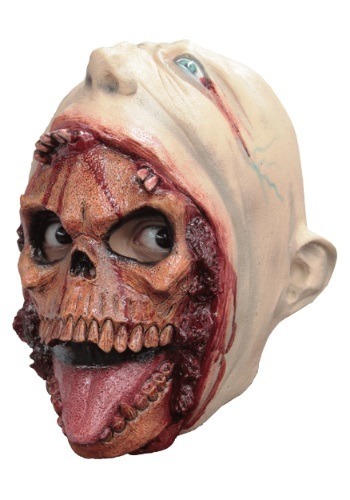 This latex mask shows a skeleton emerging from another guy’s open mouth, complete with realistic guts and gore. Honestly, we’re not sure if the wagging tongue belongs to the skeleton (wouldn’t that have atrophied by now?) or the guy. And why is the skeleton making a break for it, anyway? There are a lot of unanswered questions here, but one thing’s for sure: your kid will have all eyes on him when he walks through the door wearing the Blurp Charlie Child Mask.